For many, a golden calf reminds them of the story in Exodus 32. As the story goes, the Israelites, fairly fresh from leaving Egypt, were getting impatient while Moses was up on Mount Sinai receiving the Ten Commandments. They implored Moses' brother Aaron to "come, make us gods who will go before us." Aaron consented and ordered gold collected and fashioned into the likeness of a golden calf. The people then gathered around their newly made idol to "to eat and drink and got up to indulge in revelry." On the mountainside, God told Moses what was happening in the foothills below. The people had betrayed God, even after freeing them from slavery. In such fury, God told Moses that His "anger may burn against them and that I may destroy them." Moses interceded, put the people straight, and destroyed the abominable idol. The golden calf returned hundreds of years later during King David's grandson's time when Israel split into two kingdoms. In 1 Kings 12, Jeroboam, the first king of the northern ten tribes, knew he couldn't solidify his people if they kept going to Judah to worship at the Temple. And so, Jeroboam made two golden calves, and just like Aaron declared "Here are your gods, O Israel, who brought you up out of Egypt." This again provoked God into anger. Worship of the golden calf eventually destroyed the Northern Kingdom, as recorded in 1 Kings 13:33-34, "This was the sin of the house of Jeroboam that led to its downfall and to its destruction from the face of the earth." Now, almost 3,000 years later, the Golden Calf has returned, and this time to Sotheby's art auction house in London. As Mediabistro.com (Fri. Aug 1, 2008) reported in their article "Worshiping Damien Hirst's Golden Calf," world renowned artist Damien Hirst, known for works of art ranging from a jewel-encrusted human skull to exotic animals encased in formaldehyde, released his "Beautiful Inside My Head Forever" 2-day auction on September 15-16, 2008. 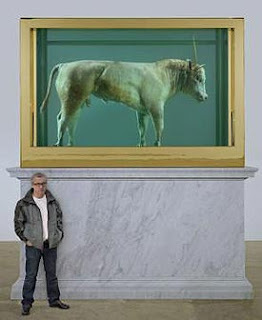 Bloomberg.com (by Scott Reyburn, Tues. Sept. 16, 2008) reports the auction took in a whopping $126.6 million, making Hirst the greatest financially commanding living artist in the world today. The piece most commanding attention was "The Golden Calf," a 13 feet tall and nearly 12 feet wide once-living 18-month-old calf. Its horns are made of 18-carat gold and it wears a golden headpiece straight out of the Illustrations section of the Bible. 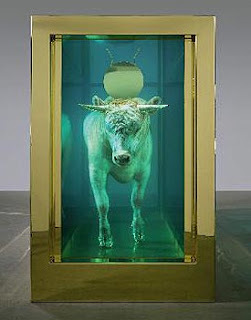 The calf is suspended in a silicone and formaldehyde brew-filled tank plated in 18 karat gold and set atop a Carrara marble plinth. Lucky number lot 13's winning bid for "The Golden Calf" came from Cheyenne Westphal, Sotheby's European chairman of contemporary art, taking instructions from a client by phone. The calf was expected to have fetched at least 8 million pounds. Quoted Sotheby's Oliver Barker of the Biblical allusion gone pop, "It indicates the idolatry of man to false idols, man's impatience, brazen imagery, but also, it draws you in because the beast himself is... so incredibly beautiful." Now, I'm not saying that people are going to parade around "The Golden Calf" naked in drunken revelry, worshipping it... though who knows what the new owner's plans are. I am also not saying that the calf"s return has anything to do with the world financial crisis, though the coincidental timing is quite intriguing. What I will conclude from the Bible is that God hates — that's right, hates — idolatry. An idol is more than just a statue. It is an extension of the human heart to rebel against the One who loved us from the womb and has great and wonderful plans for our lives. Idolatry is rebellion. Rebellion against God by definition is Evil. The symbol of evil in man is... "The Golden Calf."